Four new World War II era scrapbooks have now been digitized and are now available on DigitalNC, courtesy of our partner, the Randolph County Public Library. Stretching from 1943 to 1945, three of the scrapbooks are made up of documents, programs and news clippings about Randolph County service members in the Army and the Navy. Many of the news clippings found in these scrapbooks are of service members being stationed overseas, where they are deployed, soldiers being labeled missing or killed in action, awards given, and more. Looking through these scrapbooks reminds us of the sacrifice that these soldiers gave in support of our state and our country. The fourth is a scrapbook from 1952 consisting of documents and photos of buildings located throughout Asheboro. 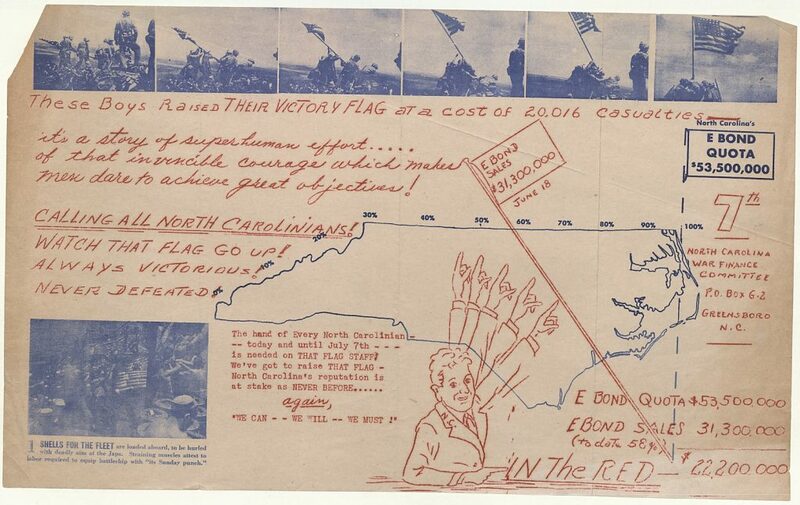 Created by Toby Samet, an art student at Asheboro High School, this scrapbook contains photos and other important papers, like a report from the city Asheboro’s 1952 campaign to clean up the city. It is a fascinating look into the past to see what Asheboro was like at that time, and what was considered important by the city. To see more of their materials and learn about the Randolph County Public Library, visit their partner page or take a look at their website.